Vehicle Sales Forecast: "Sixth Consecutive Decline in June"
The automakers will report June vehicle sales on Monday, July 3rd. Note: There were 26 selling days in June 2017, the same as in June 2016. A WardsAuto forecast calls for U.S. automakers to deliver 1.50 million light vehicles in June. A daily sales rate of 57,762 units over 26 days represents a 0.7% decline from like-2016 (also 26 days). WardsAuto is forecasting U.S. sales of 17.1 million units in calendar-year 2017. The outlook assumes a sales surge in the summer caused by deep price discounting or other means to trim the excess stock. If inventory is not cut by 400,000 to 500,000 units by September, another sell-off is possible in Q4, probably December. Without such a surge, sales are heading to 16.8 million units for the year. The seasonally adjusted annualized rate for the month will be 16.5 million vehicles, down nearly 2 percent from 16.8 million units in the same month in 2016. Overall sales are down from the record in 2016. The provisional birth rates for teenagers aged 15–17 and 18–19 were 8.8 and 37.5 births per 1,000 women, respectively, down by 11% and 8% from 2015 and record lows for both groups. The provisional birth rate for women aged 20–24 was 73.7 births per 1,000 women in 2016, a decline of 4% from 2015 (76.8), reaching again another record low for this age group. The rate for women aged 25–29 was 101.9 births per 1,000 women, down 2% from 2015 (104.3) and another record low for this age group. The provisional birth rate for women aged 30–34 in 2016 was 102.6 births per 1,000 women, up 1% from 2015 (101.5) to the highest rate for this age group since 1964. The provisional birth rate for women aged 40–44 in 2016 was 11.4 births per 1,000 women, up 4% from 2015 (11.0) to the highest rate for this age group since 1966. Births have declined for two consecutive years following increases in 2013 and 2014. A key trend is that women are waiting longer to have babies. Waiting longer to have children makes sense (see: Demographics and Behavior and U.S. Demographics: The Millennials Take Over) and we should expect a baby boom in a few years as the largest cohorts move into the 25 to 34 years old age groups. I expect that as families have babies, they will tend to buy homes (as opposed to rent). The demographics are favorable for renting now, but the demographics will become more positive for homeownership. The second graph is from the NCHS report and shows birth rates by age group. Note that the highest birth rate is now for women in the 30 to 34 age group! Far fewer teens births is great news (and is probably related to the much higher enrollment rates). The MNI Chicago Business Barometer rose to 65.7 in June from 59.4 in May, the highest level in over three years. “June’s MNI Chicago Business Barometer Survey is a testament to firms’ expectations of a busy summer. With Production and New Orders touching levels not seen in three years, rising pressure on backlogs and delivery times has led to higher optimism among firms both in general business conditions and the local economy,” said Shaily Mittal, Senior Economist at MNI Indicators. This was well above the consensus forecast. Personal income increased $67.1 billion (0.4 percent) in May according to estimates released today by the Bureau of Economic Analysis. ... personal consumption expenditures (PCE) increased $7.3 billion (0.1 percent). Real PCE increased 0.1 percent. The PCE price index decreased 0.1 percent. Excluding food and energy, the PCE price index increased 0.1 percent. The May PCE price index increased 1.4 percent year-over-year and the May PCE price index, excluding food and energy, increased 1.4 percent year-over-year. The following graph shows real Personal Consumption Expenditures (PCE) through May 2017 (2009 dollars). Note that the y-axis doesn't start at zero to better show the change. The increase in personal income was above expectations, and the increase in PCE was at expectations. Using the two-month method to estimate Q2 PCE growth, PCE was increasing at a 3.5% annual rate in Q2 2017. (using the mid-month method, PCE was increasing 3.7%). This suggests decent PCE growth in Q2. • At 8:30 AM ET, Personal Income and Outlays for May. The consensus is for a 0.3% increase in personal income, and for a 0.1% increase in personal spending. And for the Core PCE price index to increase 0.1%. • At 9:15 AM, Chicago Purchasing Managers Index for June. The consensus is for a reading of 58.2, down from 59.4 in May. • At 10:00 AM, University of Michigan's Consumer sentiment index (final for June). The consensus is for a reading of 94.5, from the preliminary reading 94.5. Fannie Mae reported that the Single-Family Serious Delinquency rate declined to 1.04% in May, from 1.07% in April. The serious delinquency rate is down from 1.38% in May 2016. This is the lowest serious delinquency rate since December 2007. The Fannie Mae serious delinquency rate has fallen 0.34 percentage points over the last year, and at that rate of improvement, the serious delinquency rate will below 1% this Summer. Reis released their Q2 2017 Office Vacancy survey this morning. Reis reported that the office vacancy rate was unchanged at 16.0% in Q2, from 16.0% in Q1. This is down from 16.1% in Q1 2016, and down from the cycle peak of 17.6%. The Office Vacancy Rate remained flat in the second quarter at 16.0%. Asking rents increased 0.4% in the quarter and only 1.6% since the second quarter of 2016 – the lowest annual rate since 2011. Continuing its lackluster pace, the Office market recorded the lowest quarterly net absorption in three years as the vacancy rate remained flat at 16.0%. One year ago, the vacancy rate was 16.1%. In the last expansion, the U.S. vacancy rate had fallen from a high of 17.0% in 2003 to a low of 12.5% in 2007. In the current expansion that is now seven quarters longer than the previous expansion, the vacancy rate has fallen from a high of 17.6% to only 16.0% as tenants have leased far fewer square feet per added employee than in past cycles. Reis reported the vacancy rate was at 16.0% in Q2. The office vacancy rate is moving sideways at an elevated level. Real gross domestic product (GDP) increased at an annual rate of 1.4 percent in the first quarter of 2017, according to the "third" estimate released by the Bureau of Economic Analysis. In the fourth quarter of 2016, real GDP increased 2.1 percent. Here is a Comparison of Third and Second Estimates. PCE growth was revised up from 0.6% to 1.1%. (still soft PCE, but better than the 0.3% reported in the Advance estimate of GDP). Residential investment was revised down slightly from 13.8% to +13.0%. This was above the consensus forecast. Mortgage rates moved moderately higher again today, as investors continued digesting the possibility of a "taper tantrum" in Europe. The average lender is once again quoting 4.0% on top tier conventional 30yr fixed scenarios. Before today (and especially before yesterday), 3.875% was fairly prevalent. • At 8:30 AM ET, The initial weekly unemployment claims report will be released. The consensus is for 239 thousand initial claims, down from 241 thousand the previous week. • Also at 8:30 AM, Gross Domestic Product, 1st quarter 2017 (Third estimate). The consensus is that real GDP increased 1.2% annualized in Q1, unchanged from the second estimate of 1.2%. • Early, Reis Q2 2017 Office Survey of rents and vacancy rates. Reis reported that the vacancy rate for regional malls was 8.1% in Q2 2017, up from 7.9% in Q1, and up from 7.9% in Q2 2016. This is down from a cycle peak of 9.4% in Q3 2011. For Neighborhood and Community malls (strip malls), the vacancy rate was 10.0% in Q2, up from 9.9% in Q1, and up from 9.8% in Q2 2016. For strip malls, the vacancy rate peaked at 11.1% in Q3 2011. The Retail Vacancy Rate increased 0.1% in the second quarter to 10.0%. Asking rents increased 0.4% in the quarter that saw new stores opening on par with the number that closed. The Mall Vacancy Rate increased 0.2% to 8.1%. Mall Rents also increased 0.4%. Defying the doom and gloom aired in media reports, the retail real estate market posted positive net absorption in the second quarter. The vacancy rate increased a bit due to new construction that was only partially absorbed by new leasing. Still, the vacancy rate increase from 9.9% to 10.0% was smaller than most expected. The increase in the Mall vacancy rate was due to confirmed closings of Macy’s stores. Recently both the strip mall and regional mall vacancy rates have increased slightly from an already elevated level. Mall vacancy data courtesy of Reis. The Pending Home Sales Index, a forward-looking indicator based on contract signings, decreased 0.8 percent to 108.5 in May from a downwardly revised 109.4 in April. The index is now 1.7 percent below a year ago, which marks the second straight annual decline and the most recent since November and December of last year. The PHSI in the Northeast decreased 0.8 percent to 96.4 in May, but remains 3.1 percent above a year ago. In the Midwest the index was 104.5 in May (unchanged from April), and is 2.8 percent lower than May 2016. Pending home sales in the South declined 1.2 percent to an index of 123.4 in May and are now 1.4 percent below last May. The index in the West subsided 1.3 percent in May to 98.6, and is now 4.5 percent below a year ago. This was below expectations of a 0.5% increase for this index. Note: Contract signings usually lead sales by about 45 to 60 days, so this would usually be for closed sales in June and July. Mortgage applications decreased 6.2 percent from one week earlier, according to data from the Mortgage Bankers Association’s (MBA) Weekly Mortgage Applications Survey for the week ending June 23, 2017. The average contract interest rate for 30-year fixed-rate mortgages with conforming loan balances ($424,100 or less) remained unchanged at 4.13 percent, with points decreasing to 0.32 from 0.34 (including the origination fee) for 80 percent loan-to-value ratio (LTV) loans. Refinance activity is mostly moving sideways at a low level this year, and will not increase significantly unless rates fall well below 4%. According to the MBA, purchase activity is up 8% year-over-year. • Early: Reis Q2 2017 Mall Survey of rents and vacancy rates. • At 10:00 AM, Pending Home Sales Index for May. The consensus is for a 0.5% increase in the index. Richmond Fed: "Manufacturers in the Fifth District Improved in June"
Reports from Fifth District manufacturers improved in June, according to the latest survey by the Federal Reserve Bank of Richmond. The composite manufacturing index rose from 1 in May to 7 in June, as the indexes for shipments and new orders increased. The employment index was relatively flat. Most firms continued to report steady or higher wages; although the index for wages did fall in June, it remained above 0. Meanwhile, more firms reported a decline in the average workweek than reported an increase. Looking six months ahead, manufacturing executives were more optimistic in June than in May, although even the May readings were very positive. This was the last of the regional Fed surveys for June. The New York and Philly Fed surveys are averaged together (yellow, through June), and five Fed surveys are averaged (blue, through June) including New York, Philly, Richmond, Dallas and Kansas City. The Institute for Supply Management (ISM) PMI (red) is through April (right axis). Based on these regional surveys, it seems likely the ISM manufacturing index will increase slightly in June compared to May (to be released this coming Monday, July 3rd). The early consensus is for the ISM index to be unchanged in June. Reis reported that the apartment vacancy rate was at 4.4% in Q2 2017, up from 4.3% in Q1, and up from 4.2% in Q2 2016. This is the highest vacancy rate since Q3 2013 (although the increase has been small). The vacancy rate peaked at 8.0% at the end of 2009. Vacancy increased in 27 Metros, but the increase exceeded 0.2% in only eight metros. The number of new completions was lower than had been expected as was net absorption. The growth in effective rents suggests that landlords’ offers of free rent were less aggressive as the apartment market continued to benefit from stronger housing prices keeping more potential home buyers in rentals. Total inventory is expected to increase significantly in 2017; however, construction in the second quarter was lower than expected in a quarter that tends to see the highest activity. New construction of 36,477 units was the lowest quarterly addition in more than two years. With less new supply coming online, landlords were able to curb their concessions. At 4.4%, the national vacancy rate increased 10 basis points from 4.3% in the first quarter. One year ago, the vacancy rate was 4.2%. Occupancy growth, or net absorption, while low at 27,818 units, fell just shy of new supply pushing the vacancy rate up in the quarter. The vacancy rate had been mostly moving sideways for the last few years. However it appears the vacancy rate has bottomed and is starting to increase. With more supply coming on line later this year - and less favorable demographics - the vacancy rate will probably continue to increase slowly. 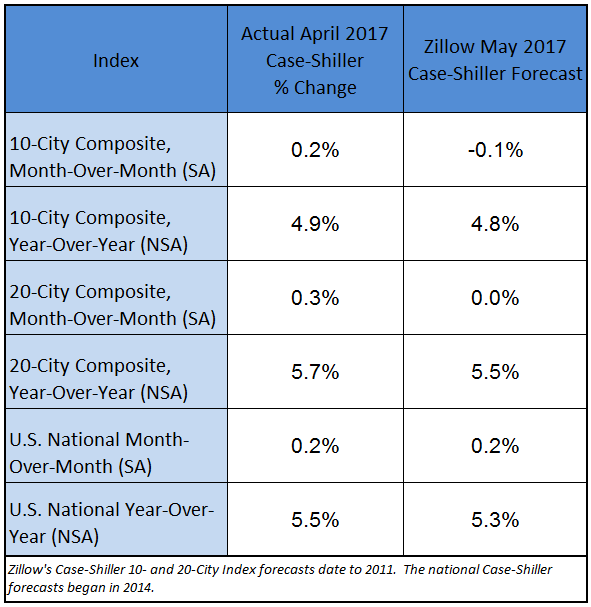 S&P/Case-Shiller released the monthly Home Price Indices for April ("April" is a 3 month average of February, March and April prices). The S&P CoreLogic Case-Shiller U.S. National Home Price NSA Index, covering all nine U.S. census divisions, reported a 5.5% annual gain in April, down from 5.6% last month. The 10-City Composite annual increase came in at 4.9%, down from 5.2% the previous month. The 20-City Composite posted a 5.7% year-over-year gain, down from 5.9% in March. Seattle, Portland, and Dallas reported the highest year-over-year gains among the 20 cities. In April, Seattle led the way with a 12.9% year-over-year price increase, followed by Portland with 9.3%, and Dallas with an 8.4% increase. Seven cities reported greater price increases in the year ending April 2017 versus the year ending March 2017. Before seasonal adjustment, the National Index posted a month-over-month gain of 0.9% in April. The 10-City Composite posted a 0.8% increase and the 20-City Composite reported a 0.9% increase in April. After seasonal adjustment, the National Index recorded a 0.2% month-over-month increase. The 10-City Composite posted a 0.2% month-over-month increase. The 20-City Composite posted a 0.3% month-over-month increase. 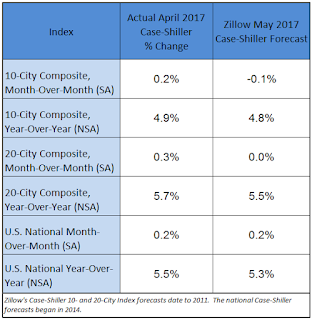 Eighteen of 20 cities reported increases in April before seasonal adjustment; after seasonal adjustment, 13 cities saw prices rise. “As home prices continue rising faster than inflation, two questions are being asked: why? And, could this be a bubble?” says David M. Blitzer Managing Director and Chairman of the Index Committee at S&P Dow Jones Indices. “Since demand is exceeding supply and financing is available, there is nothing right now to keep prices from going up. The increase in real, or inflation-adjusted, home prices in the last three years shows that demand is rising. At the same time, the supply of homes for sale has barely kept pace with demand and the inventory of new or existing homes for sale shrunk down to only a four- month supply. Adding to price pressures, mortgage rates remain close to 4% and affordability is not a significant issue. The Composite 10 index is off 6.6% from the peak, and up 0.2% in April (SA). The Composite 20 index is off 4.0% from the peak, and up 0.3% (SA) in April. The National index is 2.4% above the bubble peak (SA), and up 0.2% (SA) in April. The National index is up 38.4% from the post-bubble low set in December 2011 (SA). The Composite 10 SA is up 4.9% compared to April 2016. The Composite 20 SA is up 5.6% year-over-year. The U.S. hotel industry reported mostly positive year-over-year results in the three key performance metrics during the week of 11-17 June 2017, according to data from STR. The red line is for 2017, dashed is 2015 (best year on record), blue is the median, and black is for 2009 (the worst year since the Great Depression for hotels). Currently the occupancy rate is tracking close to last year, and just behind the record year in 2015. For hotels, occupancy will increase further during the summer travel season. Freddie Mac reported that the Single-Family serious delinquency rate in May was at 0.87%, down from 0.92% in April. Freddie's rate is down from 1.11% in May 2016. This is the lowest serious delinquency rate since May 2008. Although the rate is still declining, the rate of decline has slowed. Maybe the rate will decline another 0.2 to 0.3 percentage points or so to a cycle bottom, but this is pretty close to normal. Note: Fannie Mae will report for May soon. Other measures of current manufacturing activity also indicated that growth moderated. The new orders and growth rate of orders indexes fell several points each, coming in at 9.6 and 4.7, respectively. The capacity utilization index moved down to 12.3, and the shipments index retreated to 8.5 after surging last month. Perceptions of broader business conditions improved in June, although the indexes were less positive than in May. The general business activity index edged down to 15.0. The company outlook index posted a 10th consecutive positive reading but fell nine points to 10.8. Labor market measures indicated continued employment gains and longer workweeks this month. The employment index posted a sixth consecutive positive reading and edged up to 9.6. Nineteen percent of firms noted net hiring, compared with 10 percent noting net layoffs. The hours worked index dropped to 8.9, down seven points from a six-year high last month. CR note: This suggests solid growth, although at a slower pace than in May. The recent decline in oil prices might impact the Dallas surveys in coming months. Chicago Fed "Index Points to Slower Economic Growth in May"
Led by declines in production-related indicators, the Chicago Fed National Activity Index (CFNAI) moved down to –0.26 in May from +0.57 in April. Three of the four broad categories of indicators that make up the index decreased from April, and three of the four categories made negative contributions to the index in May. The index’s three-month moving average, CFNAI-MA3, declined to +0.04 in May from +0.21 in April. This suggests economic activity was close to the historical trend in May (using the three-month average). • At 8:30 AM ET, Durable Goods Orders for May from the Census Bureau. The consensus is for a 0.4% decrease in durable goods orders. • Also at 8:30 AM, Chicago Fed National Activity Index for May. This is a composite index of other data. • At 10:30 AM, Dallas Fed Survey of Manufacturing Activity for June. From CNBC: Pre-Market Data and Bloomberg futures: S&P futures are down 3 and DOW futures are down 10 (fair value). Oil prices were down over the last week with WTI futures at $43.21 per barrel and Brent at $45.54 per barrel. A year ago, WTI was at $47, and Brent was at $47 - so oil prices are down about 5% to 10% year-over-year. Here is a graph from Gasbuddy.com for nationwide gasoline prices. Nationally prices are at $2.25 per gallon - a year ago prices were at $2.32 per gallon - so gasoline prices are down 7 cents year-over-year. Some common contributors to past recessions look less worrisome today. ... the dominant cause of postwar US recessions—rapid rate hikes in response to high inflation, often boosted by oil shocks—is less threatening today due to the anchoring of inflation expectations and the rise of shale. [Our model] now estimates a 1/4 chance of recession over the next two years, somewhat below the unconditional probability over two years of 1/3 since 1980. CR note: Some day there will be another recession, but I don't see signs of a recession in the next year or more. New home sales for May were reported at 610,000 on a seasonally adjusted annual rate basis (SAAR). This was above the consensus forecast, and the three previous months combined were revised up. Overall this was a solid report. Sales were up 8.9% year-over-year in May. Earlier: New Home Sales increase to 610,000 Annual Rate in May. This graph shows new home sales for 2016 and 2017 by month (Seasonally Adjusted Annual Rate). Sales were up 8.9% year-over-year in May. For the first five months of 2017, new home sales are up 12.2% compared to the same period in 2016. This was a strong year-over-year increase through May, however sales were weak in Q1 last year, so this was a somewhat easy comparison. The "distressing gap" graph shows existing home sales (left axis) and new home sales (right axis) through May 2017. This graph starts in 1994, but the relationship had been fairly steady back to the '60s. The Census Bureau reports New Home Sales in May were at a seasonally adjusted annual rate (SAAR) of 610 thousand. The previous three months combined were revised up. "Sales of new single-family houses in May 2017 were at a seasonally adjusted annual rate of 610,000, according to estimates released jointly today by the U.S. Census Bureau and the Department of Housing and Urban Development. This is 2.9 percent above the revised April rate of 593,000 and is 8.9 percent above the May 2016 estimate of 560,000." The months of supply was unchanged in May at 5.3 months. "The seasonally-adjusted estimate of new houses for sale at the end of May was 268,000. This represents a supply of 5.3 months at the current sales rate." In May 2017 (red column), 58 thousand new homes were sold (NSA). Last year, 53 thousand homes were sold in May. This was above expectations of 590,000 sales SAAR, and the previous months were revised up. A solid report. I'll have more later today. Mortgage rates have been so little-changed in recent days that yesterday's coverage wouldn't need to be changed in order to apply perfectly today. The absence of change continues to be a good thing given that rates remain very close to their lowest levels in more than 8 months. Only a handful of recent days have been any better. 4.0% is the most prevalently-quoted conventional 30yr fixed rate on top tier scenarios, though a few of the aggressive lenders remain at 3.875%. • At 8:30 AM ET: New Home Sales for May from the Census Bureau. The consensus is for an increase in sales to 590 thousand Seasonally Adjusted Annual Rate (SAAR) in May from 569 thousand in April. New detailed estimates show the nation’s median age — the age where half of the population is younger and the other half older — rose from 35.3 years on April 1, 2000, to 37.9 years on July 1, 2016. Residents age 65 and over grew from 35.0 million in 2000, to 49.2 million in 2016, accounting for 12.4 percent and 15.2 percent of the total population, respectively. This graph uses the data in the July 1, 2016 estimate released today. Using the Census data, here is a table showing the ten most common ages in 2010 and 2016. Note the younger baby boom generation dominated in 2010. By 2016 the millennials have taken over. The six largest groups, by age, are in their 20s - and eight of the top ten are in their 20s. My view is this is positive for both housing and the economy. The Federal Reserve Bank of Kansas City released the June Manufacturing Survey today. According to Chad Wilkerson, vice president and economist at the Federal Reserve Bank of Kansas City, the survey revealed that Tenth District manufacturing activity expanded further with strong expectations for future activity. The Kansas City region was hit hard by the sharp decline in oil prices, but activity has been expanding as oil prices increased. It is too early to tell if the recent decline in oil prices will impact the Kansas City region again. According to Black Knight's First Look report for May, the percent of loans delinquent decreased 7.1% in May compared to April, and declined 10.8% year-over-year. The percent of loans in the foreclosure process declined 3.0% in May and were down 26.9% over the last year. Black Knight reported the U.S. mortgage delinquency rate (loans 30 or more days past due, but not in foreclosure) was 3.79% in May, down from 4.08% in April. The percent of loans in the foreclosure process declined in May to 0.83%. The number of delinquent properties, but not in foreclosure, is down 226,000 properties year-over-year, and the number of properties in the foreclosure process is down 153,000 properties year-over-year. In the week ending June 17, the advance figure for seasonally adjusted initial claims was 241,000, an increase of 3,000 from the previous week's revised level. The previous week's level was revised up by 1,000 from 237,000 to 238,000. The 4-week moving average was 244,750, an increase of 1,500 from the previous week's revised average. The previous week's average was revised up by 250 from 243,000 to 243,250. The dashed line on the graph is the current 4-week average. The four-week average of weekly unemployment claims increased to 244,750. This was close to the consensus forecast. • At 8:30 AM ET: The initial weekly unemployment claims report will be released. The consensus is for 240 thousand initial claims, up from 237 thousand the previous week. • At 9:00 AM, FHFA House Price Index for April 2017. This was originally a GSE only repeat sales, however there is also an expanded index. • At 11:00 AM, the Kansas City Fed manufacturing survey for June. The Federal Reserve Bank of Philadelphia has released the coincident indexes for the 50 states for May 2017. Over the past three months, the indexes increased in 44 states, decreased in five, and remained stable in one, for a three-month diffusion index of 78. In the past month, the indexes increased in 36 states, decreased in seven, and remained stable in seven, for a one-month diffusion index of 58. In May, 43 states had increasing activity (including minor increases). The downturn in 2015 and 2016, in the number of states increasing, was mostly related to the decline in oil prices. The reason for the recent decrease in the number of states with increasing activity is unclear - and might be revised away. Earlier: NAR: "Existing-Home Sales Rise 1.1 Percent in May"
"I project that US existing home sales as estimated by the National Association of Realtors ran at a seasonally adjusted annual rate of 5.65 million in May, up 1.4% from April’s preliminary pace and up 3.3% from last May’s seasonally adjusted pace." 2) Inventory is still very low and falling year-over-year (down 8.4% year-over-year in May). I started the year expecting inventory would be increasing year-over-year by the end of 2017. That now seems unlikely, but still possible. More inventory would probably mean smaller price increases, and less inventory somewhat larger price increases. Sales NSA in May (red column) were above May2016. (NSA) - and the highest for May since 2006. NAR: "Existing-Home Sales Rise 1.1 Percent in May"
Total existing-home sales, which are completed transactions that include single-family homes, townhomes, condominiums and co-ops, climbed 1.1 percent to a seasonally adjusted annual rate of 5.62 million in May from a downwardly revised 5.56 million in April. Last month's sales pace is 2.7 percent above a year ago and is the third highest over the past year. Total housing inventory at the end of May rose 2.1 percent to 1.96 million existing homes available for sale, but is still 8.4 percent lower than a year ago (2.14 million) and has fallen year-over-year for 24 consecutive months. Unsold inventory is at a 4.2-month supply at the current sales pace, which is down from 4.7 months a year ago. Sales in May (5.63 million SAAR) were 1.1% higher than last month, and were 2.7% above the May 2016 rate. According to the NAR, inventory increased to 1.96 million in May from 1.92 million in April. Headline inventory is not seasonally adjusted, and inventory usually decreases to the seasonal lows in December and January, and peaks in mid-to-late summer. Inventory decreased 8.4% year-over-year in May compared to May 2016. Months of supply was at 4.2 months in May. Design services at architecture firms continue to project a healthy disposition on the construction industry as the Architecture Billings Index (ABI) recorded the fourth consecutive month of growth. As a leading economic indicator of construction activity, the ABI reflects the approximate nine to twelve month lead time between architecture billings and construction spending. The American Institute of Architects (AIA) reported the May ABI score was 53.0, up from a score of 50.9 in the previous month. This score reflects an increase in design services (any score above 50 indicates an increase in billings). The new projects inquiry index was 62.4, up from a reading of 60.2 the previous month, while the new design contracts index increased from 53.2 to 54.8. This graph shows the Architecture Billings Index since 1996. The index was at 53.0 in May, up from 50.9 the previous month. Anything above 50 indicates expansion in demand for architects' services. According to the AIA, there is an "approximate nine to twelve month lag time between architecture billings and construction spending" on non-residential construction. This index was positive in 9 of the last 12 months, suggesting a further increase in CRE investment in 2017 and early 2018. Mortgage rates were steady to slightly lower today, with underlying bond markets essentially erasing the damage seen yesterday. This was neither here nor there for the mortgage world as most lenders didn't adjust rates much higher yesterday (despite bond weakness). Thus, they didn't have much to do today when bonds strengthened. In general "bond market strength" = lower rates and vice versa. 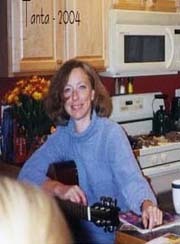 • At 10:00 AM, Existing Home Sales for May from the National Association of Realtors (NAR). The consensus is for 5.55 million SAAR, down from 5.57 million in April. Housing economist Tom Lawler expects the NAR to report sales of 5.65 million SAAR in May. • During the day: The AIA's Architecture Billings Index for May (a leading indicator for commercial real estate). This is a key housing market to follow since Phoenix saw a large bubble and bust, followed by strong investor buying. 1) Overall sales in May were up 9.3% year-over-year. 2) Active inventory is now down 9.5% year-over-year. This is the seventh consecutive month with a YoY decrease in inventory, and prices are up 1.7% through March (7.1% annual rate). Note: This appears to be a leading indicator for industrial production. The Chemical Activity Barometer (CAB), a leading economic indicator created by the American Chemistry Council (ACC), was flat in June following a 0.2 percent gain in May, and a 0.3 percent gain in April. This marks a slowing from the average 0.5 percent first quarter monthly gain. Compared to a year earlier, the CAB is up 4.3 percent year-over-year, a modest yet continued slowing. All data is measured on a three-month moving average (3MMA). Applying the CAB back to 1912, it has been shown to provide a lead of two to fourteen months, with an average lead of eight months at cycle peaks as determined by the National Bureau of Economic Research. The median lead was also eight months. At business cycle troughs, the CAB leads by one to seven months, with an average lead of four months. The median lead was three months. The CAB is rebased to the average lead (in months) of an average 100 in the base year (the year 2012 was used) of a reference time series. The latter is the Federal Reserve’s Industrial Production Index. This graph shows the year-over-year change in the 3-month moving average for the Chemical Activity Barometer compared to Industrial Production. It does appear that CAB (red) generally leads Industrial Production (blue). CAB increased solidly in early 2017 suggesting an increase in Industrial Production, however, the year-over-year increase in the CAB has slowed recently.